Manchester United, Tottenham and Liverpool await Friday's Europa League round of 16 draw - with an all-English tie a possibility. Spanish side Valencia, managed by ex-United defender Gary Neville, are also in the draw which takes place in Switzerland at about 12:00 GMT. 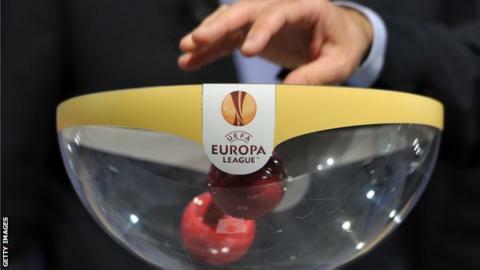 Holders Sevilla and German giants Borussia Dortmund are among the favourites to win the competition. There are no seedings or restrictions on facing sides from your own country. The last-16 ties will be played on 10 and 17 March. The final takes place at Basel's St Jakob-Park on Wednesday, 18 May. Valencia coasted into the last 16 as they thrashed Austrian hosts Rapid Vienna 4-0 to complete a 10-0 aggregate win. Fellow Spanish outfit Sevilla, who have won the Europa League for the past two seasons, lost 1-0 at Norwegian side Molde but eased through 3-1 on aggregate. Dortmund, currently second in the Bundesliga, progressed as Porto goalkeeper Iker Casillas's own goal, after Pierre-Emerick Aubameyang's shot hit the crossbar, sealed a 3-0 aggregate win. Swiss champions Basel are still on course to reach a 'home' final after a dramatic injury-time win against French side St Etienne. Luca Zuffi scored a late goal for a 2-1 win on the night, sending Basel through on away goals after the tie finished 4-4. Italian title chasers Napoli were eliminated after a 1-1 home draw against Villarreal put the Spanish team through 2-1.